Two multi-functional swimming pools with a slide offer a merry time to al of the visitors of the Aquapark. Should any dark thoughts or painful exeriences torture your soul, here all this suffering will finally come to an end. 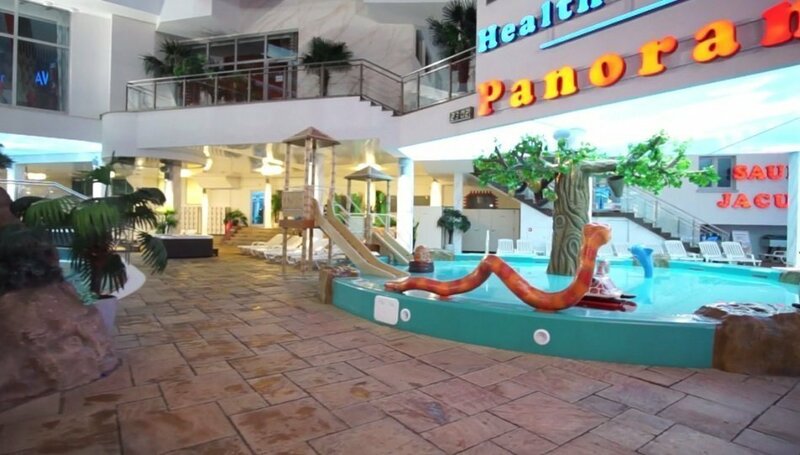 In the pools there are wall massage points, neck massage devices, air geysers with the sea wave effect as well as hydro massage, water mushroom and pipe deckchairs with the air massage function as well as a slide connecting the pool basins. The pools are 1,20 - 1,35 m deep, the water is heated from 29 May until 16 September. An external pool 770 m2 with lots of attractions for all the watermen! The soft and gentle slope (0 - 1,6) iminates a disembarkation to the beach and guarantees safe fun even for the youngest children. The air geysers make you feel as if you were amongst the Baltic waves and provide you with a perfect hydro massage of your lower limbs. Both our little ad slightly older guests will have here fun beyond their imagiation! Internal swimming pool "Water Fairytale"
Specially for families with little children, our Aquapark has prepared an internal swimming pool 25 cm deep with two slides and heated water all the year rouund. Your kids will find here a magical world, full of fairies and fantasy! And we can give you our word - even a child who has seen it all, will have here a whale of a time! The internal pool 55 m long and 1,25 m deep shall entertain you throughout the year. There are two slides and three neck massage options. Have fun, everyone! The water is warm, whatever the season!